Are you looking for a complete workout machine to get a quality exercise regiment started? Sportaid offers the multi-purpose Apex Challenge Circuit 7000 Workout Machine to get a complete and total workout. This premier equipment is designed to be optimized suitably for wheelchair users. Additionally, its sports equipment technology can also be used by able bodied people. With a life time warranty on its frame, Sportaid offers the machine on sale with Low Price Match Promise. Select from the top manufacturers and save big with Sportaid.com's everyday low prices. Get your Para and Quad Apex Workout Machine from Sportaid now and save 23% today! 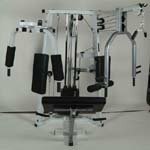 For a Complete Workout Choose Para and Quad Apex workout Machine from Sportaid.com! The Apex Challenge Circuit 7000 Workout Machine is designed to allow paraplegic and quadriplegic individuals to get a complete workout. The space saving work out machine lets you perform without any assistance. Feel free to call 1-800-743-7203 for expert assistance. And be the best you can be by choosing Sportaid as your Disability Sports Equipment supplier. Whether you are a first time shopper or someone who has been with us from the beginning, satisfaction is guaranteed. After over 25 years in the business helping people find Para and Quad Apex Workout Machine at lowest prices, we continue to lead the industry! We carry a large selection of wheelchair cushions, wheelchair parts, and wheelchair accessories. We are capable of beating any competitor's advertised price, just call! Our customer service staff has over 50 years of experience, plus over 90 years of combined wheelchair use experience. We look forward to working with you!